Sam DeCounter FFA Advisor/COOP Supervisor and Melvin Roth, Assistant Advisor along with the Illini West FFA members were giving their "congratulations!" to high school sophomores Kirby Fecht and Taylor Hardy. 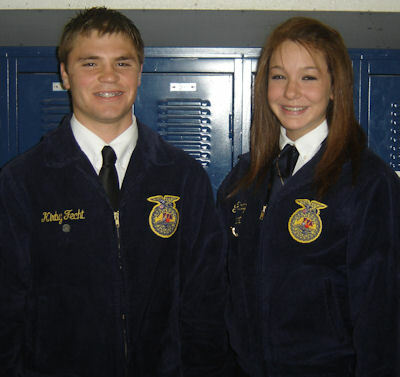 Kirby and Taylor, of the Illini West FFA Chapter, were selected as officers to the 2010-2011 Section Xi Officer team. Kirby is the son of Dean and Angie Fecht of Carthage and currently serves as the Chapter Reporter for the IW FFA Program. He will take over the duties as Section Xi Reporter. Taylor is the daughter of Jim and Vicki Hardy of Carthage and currently serves as the Greenhand President. She will take over as the Section Sentinel. They will take office June 1st.